Access: Left Miller’s at 3:45 PM and returned at 5:00 PM on the Julia Miller captained by Joe Ternyila and returned on the Anthony Miller, captained by Carl Hoerning. Purpose of the trip: Josh will do the brick masonry in the kitchen, thus restoring Kate’s pantry, and needed to see the job. We wanted to see how the lighthouse had fared since our last trip out on January 15, and start bringing paint and supplies back out, check the structure, and do some measuring and planning. Task accomplished: The place was immaculate, except for signs of some leakage from the Watch Gallery door due to the heavy storm we had on April 15. Next steps: Josh will line the pantry with bricks, and then we will paint it. He will also repair the two troughs left from the Coast Guard plumbing in the promenade surface. Following that we will have the cellar scraped and cleaned and cover the dirt floor with cement. We will install the three missing port lights on the fourth level; we need expert assistance with that project. We will address ventilation issues as soon as possible, and resume working on the exterior of the Lantern Gallery, providing the wind doesn’t blow the paint off the brushes. The deterioration of the entire exterior requires that we paint it. It has aged rapidly in the last two years. We are in need of a carpenter to build a new Watch Gallery door. Any suggestions are welcome. We also need gallon plastic jugs because Josh will need at least 10 gallons of water for the masonry job. When and if you can, please let Erin Urban know what weekdays you might be available for a Crew date from 9 AM-3:30 PM. If you are not available on weekdays, please let her know that as well; we may have to have a few weekend trips this season. Access: Left Miller’s at 10:45 AM and returned at 1:45 PM on the Nicholas Miller captained by Dave Steckley. Purpose of the trip: We wanted to clear out all perishable supplies and tighten the place up for the season ahead. Task accomplished: Carmen drained the generator of gasoline, and we brought back three 5-gallon cans; one full of gasoline, one half-full, and one empty. We lowered down about 25 gallons of paint, epoxy, and primer from the third floor. We also cleared out the other perishable supplies like caulk and foam sealants. Carmen was able to get the latch on the Watch Gallery door closed using some old wire and Stefan roped the door closed with another line. We stuffed rags and plastic and into three holes in the Lantern Gallery and taped them closed; there was water on the floor of the Watch Gallery which we think may have come from them; they accommodate the Coast Guard and NOAA wiring. We left the Lantern Gallery hatch open, and decided not to put the Watch Gallery hatch back and instead covered the opening with the old wood window covers wrapped in plastic. Stefan brought everything down from the promenade to the platform, and we loaded the Nicholas and brought it back to the museum. Stefan applying sealant to the roof and finial. Access: We could not leave Miller’s until 10:15 AM because of the tide, and we returned at 3:30 PM on the Nicholas Miller captained by Rob Stumley. Purpose of the trip: We wanted to finish painting the exterior Lantern Gallery walls, start on the roof, and install the ventilation disks in the walls and the hatch cover, and work on the Watch Gallery hatch cover, among other things. 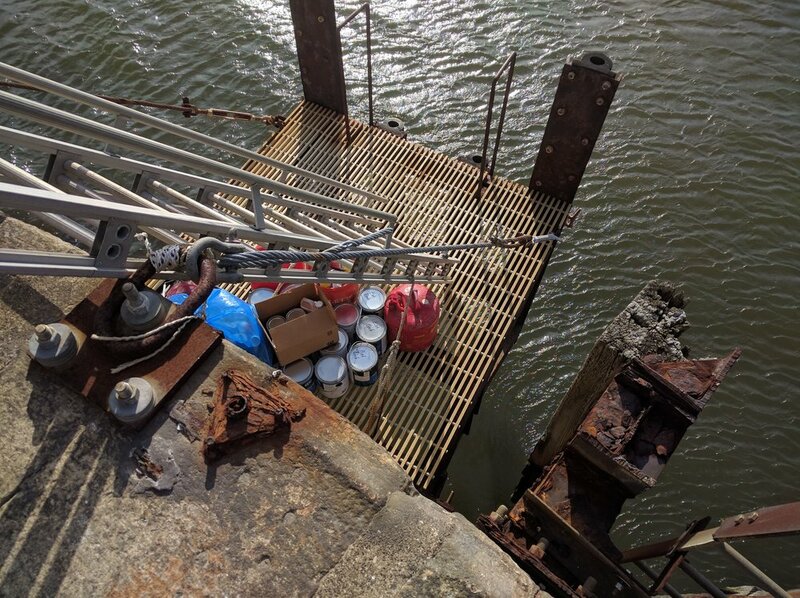 Task accomplished: When we arrived we saw that the 4’ x 6’ plastic container in which we keep the gasoline had blown about 10’ across the promenade, so we moved it inside and cleaned up the gasoline that had spilled inside of it. The approach ladder had come loose, so we roped it on until we can replace the hardware. Stefan, roped in with our rappelling gear and with help from Erin, applied sealant to the roof and finial, all of which were rusty. Cooper sanded and then finished painting the first coat on the Lantern Gallery walls. Eileen installed the ventilation disks that she had restored in the walls of the Lantern Gallery, and she and Carmen scraped and primed the interior floor and light stand. Carmen was able to put the Lantern Gallery hatch cover, which we had restored last year, back in place. Leslie working on the Watch Gallery hatch cover. Leslie took the Watch Gallery hatch cover outside and sanded all of the remaining paint off the surface. Then we brought it back inside, and she sanded and cleaned up the metal hardware and painted it black. Erin applied sealant to the Watch Gallery balcony rails but the wind was brisk and blowing it around; by the afternoon, we realized that we could not paint the roof or the Lantern Gallery deck as we had hoped because the wind had come up so briskly. We did an inventory of all of the paint that John Tretout of Armorica Sales has given us; we have enough paint for the roof and stairwell, and, as he suggested, we brought some back to the museum where it can be kept in stable conditions. We checked out the Watch Gallery ceiling windows, two of which have to be replaced with ¾” green glass, and measured them and figured out how to restore the plaster that holds the glass in. Carmen determined that he can grind off the rusty hinges on the exterior cellar door and replace them with hinges that can be screwed into place instead of welding them on, as we do not have welding equipment at the lighthouse. Noble Crew member Kevin Mahoney working on the Lantern Gallery windows and walls. Access: Nate Strain took us out on the Erin Miller at 9:50 AM and Rob Stumley brought us back at 3:00 PM on the Nicholas Miller. Purpose of the trip: We wanted to finish caulking and painting the window casements and the sides of the Lantern Gallery exterior and finish stripping the Watch Gallery hatch cover so we can put it back in place. We had to continue sanding and varnishing interior door surfaces, put UV filters on more of the windows, and work on the dog door threshold. We needed an HVAC expert to advise us about proper ventilation. Noble Crew member Annie Rech with the Watch Gallery hatch cover. Tasks accomplished: Kevin, David, and Megan scraped, painted and caulked the remaining five 26 ½ x 35 ½-inch windows in the Lantern Gallery and painted more of the walls. The windows are now complete and no longer leak.. Erin scraped and epoxied the metal area below the dog door and Annie epoxied the pieces of wood for it, which we brought out and will assemble. Annie worked on the Watch Gallery hatch cover; we should be able to finish stripping the paint off it and varnish it on the next trip out. Erin put the second coat of varnish on the remaining interior door, and Megan put UV filters on the second floor stairwell window. Tony explored the entire facility to determine the correct approach to ventilation. He noted that we can use the solar panels from the web camera, which will save us money. For the next season we will put a louvered vent in the inner wooden kitchen door; the exterior steel door already has a vent. We will put an exhaust fan in the wall of the Watch Gallery where there already is an aperture that is now sealed to the outside through which a pipe vented the lighthouse when it was heated. The fan will pull cool air through the entire structure and keep the moisture and heat down. One of the doors to the shed that Miller’s bought for us blew away, never to be seen again, and the top had blown off, so Meg and Kevin took the pieces inside and stored them in the kitchen. Next steps: We will finish painting the exterior walls and the roof of the Lantern Gallery and finish restoring and varnishing the Watch Gallery hatch cover and install the Lantern Gallery hatch cover and ventilation disks. We will build and install a threshold for the dog door. We will work with Chris Steffens and Tony on ventilation. We will prime the Watch Gallery exterior and paint it. Access: Pilot Rob Stumley took us out at 9:15 AM and brought us back at 3:45 PM on the Anthony Miller. Purpose of the trip: We wanted to work on the Lantern Gallery exterior—the sides, window casements, and railings. We had to continue peeling poly from the interior doors and varnishing the surfaces. We wanted to put UV filters on more of the windows and to keep working on the Watch Gallery hatch cover. Tasks accomplished: Eileen, Leslie and Kevin scraped, painted and caulked five of the 26 ½ x 35 ½-inch windows in the Lantern Gallery. We have five more to do. Kevin installed a wooden door on the aperture from the kitchen to the cellar. Annie finished sanding down an entry door and worked on the Watch Gallery hatch cover. Megan put the second coat of varnish on the closet doors in the sitting room and put a first coat on the other newly sanded door. She and Annie re-hung the two sitting room doors. Erin assisted Kevin, wire-brushed a flight of stairs from the kitchen to the sitting room, and cleaned up. Next steps: We will continue to address the Lantern Gallery by finishing the painting of the interior window casements and the exterior casements and walls, and the exterior of the roof. We will build and install a threshold for the dog door. We will paint the exterior walls around the Watch Gallery. We will continue to address the stairs, which need to be scraped, epoxied, primed, and painted. We will meet with Tony Cucurullo, the museum’s HVAC specialist, at the lighthouse to address ventilation issues and, as he advises, install a solar fan in the Watch Gallery door and another in the door from the kitchen to the cellar. Access: We left Miller’s at 9:15 AM on the Miller Boys piloted by Michael Sabatino and came back on the Nicholas with Mike at 12:30 PM. Purpose of the trip: We had to shore up apertures before the coming storm. Tasks accomplished: Eileen caulked six windows that were leaking at the top in the Lantern Gallery. Megan and Erin put sealant around the edges of the three operable port lights which do not have rims and glass yet. They are in Jacob’s room, Mae’s room, and the stairwell. They covered the Watch Gallery door with plastic and stuffed rags in plastic bags in the area in the Watch Gallery ceiling which is open and is leaking and then covered it with plastic. They put plastic at the bottom of the dog door to cut back on damage from leakage up there. They put the hatch cover back in Watch Gallery so that that aperture is tight. Next steps: We will continue to remove the deteriorating polyurethane from the interior doors. Weather permitting we will paint the interior ladder from the Watch Gallery to the fourth level. We will install a solar fan in the Watch Gallery door. We will continue to address the Lantern Gallery by finishing up the painting of the interior window casements and the exterior casements and walls, and paint the exterior of the roof. We will build and install a threshold for the dog door because we have done so much work that is being compromised by leakage from there. We will paint the exterior walls around the Watch Gallery. Access: We left Miller’s at 9:15 AM on the Julia Miller piloted by Rob Stumley and came back on the Nicholas with Rob at 2:30 PM. Purpose of the trip: We wanted to work on the Lantern Gallery exterior—the sides, window casements, and railings. We had to continue peeling poly from the interior doors and varnishing the surfaces. If they held up, we wanted to put UV filters on more of the windows. We needed to keep working on the Watch Gallery hatch cover and had to clean up from the installation of the cover on the kitchen wall. Task accomplished: Leslie and Stephen scraped, sanded, taped, and painted two exterior sections of the Lantern Gallery. Megan put a coat of paint on the base of the railings up there. Annie worked on removing water-based polyurethane from another door; Megan and Erin sanded two doors, and Megan put a second coat of varnish on them. The UV filters held up, and Meg put a set on another window; we will make more sets at the museum and cover all the windows. Erin cleaned up from the installation of the cover on the hole in the kitchen wall and worked on removing paint from the Watch Gallery hatch cover. Leslie and Stephen took a look at ventilation issues, especially in the cellar. We brought out a door to put between the kitchen and cellar and ordered a solar fan for the Watch Gallery door, and will work on installing them next week. Next steps: We will continue to remove the deteriorating polyurethane from the interior doors applying Man o’ War marine spar varnish to them. Weather permitting we will paint the interior ladder from the Watch Gallery to the fourth level. We will install a solar fan in the Watch Gallery door and a door to the cellar from the kitchen. We will continue to address the Lantern Gallery by finishing up the painting of the interior window casements and the exterior casements and walls, and paint the exterior of the roof. We will build and install a threshold for the dog door because we have done so much work that is being compromised by leakage from there. We will paint the exterior walls around the Watch Gallery. Access: We left Miller’s at 9:15 AM on the Julia Miller piloted by Ryan Novak-Smith and came back on the Nicholas Miller piloted by Michael Durrant at 3:00 PM. Purpose of the trip: We wanted to work on the Lantern Gallery window casements and railings. We had to continue peeling poly from the interior doors and varnishing the surfaces that are sanded. We wanted to put UV filters on some of the windows and see if they help with light damage. We brought the Watch Gallery hatch cover back from Erin Urban’s house to continue removing paint from it in situ. Task accomplished: Terry DeMeo provided transport for the new enclosure for the generator that Miller’s purchased for us and sent Vinny Doria to carry it up and help assemble it. It’s great not to have to lift the generator every time we have to use it; we can simply roll it in and out of the enclosure. Though the temperature was 100º in the Lantern Gallery, Eileen taped and painted six Lantern Gallery window casements and sills. Annie scraped the exterior casements but it was too windy to paint outside. Megan and Erin scraped, sanded, and put a coat of varnish on the two interior doors from which we had removed water-based polyurethane, and continued to remove ploy from another door. It’s a slow process and such a sorry waste of time considering that the doors were done and hung, and we now have to remove each of them, get the poly off, sand and varnish them, re-install the hinges and doorknobs, and re-hang them. Megan put UV filters on two windows, one facing Manhattan and the other facing Staten Island. We will see how they hold up before we apply them to the rest of the windows. She and Eileen put a second coat of paint on the Watch Gallery ladder. Annie worked on poly removal. Erin worked on removing paint from the Watch Gallery hatch cover; that will bring the effort to about 12 hours worth of attempts to strip it with Peel Away, a strong solvent donated by John Tretout, Goof Off recommenced by Halina McCormack, and finally a citrus-based stripping product. Next steps: We will continue to remove the deteriorating polyurethane from the interior doors by scraping and peeling it off and then apply Man o’ War marine spar varnish to them. Weather permitting we will finish painting the interior ladders black. We will purchase a solar-powered fan and install it in the Watch Gallery door. We will also purchase a door from the kitchen to the cellar and put a vent in it; moist, hot air is billowing up from the cellar. We will continue to address the Lantern Gallery; finish painting the interior window casements, start on the outside casements and walls, put another coat of paint on the railings up there, and paint the exterior of the roof. We will build a threshold for the dog door because we have done so much work that is being compromised by leakage from there. We will determine the procedure for painting the stairwell steps, choose what color to use, and prep and paint them. We have to find or fabricate metal rims for two of the three port lights and install them. We have to grind off the rusted hinges on the exterior door to the cellar and weld on replacement hinges. We have to grind the casements on the kitchen windows so that we can paint them and make shutters for them. At some point this season we will paint the exterior walls around the Watch Gallery and the exterior walls and railings around the Lantern Gallery. Steve Kalil completed the cover for the hole in the kitchen wall caused by superstorm Sandy, and Miller’s got it out to the lighthouse. Both services and all materials were donated by Steve Kalil and Glen Miller. We are waiting for Scott Van Campen to put the cover over the hole. Access: We left Miller’s at 9:15 AM on the Emily Miller piloted by Rob Stumley and came back with him on the Emily at 3:30 PM. Purpose of the trip: We needed to work on the Lantern Gallery window casements and railings. We had to continue peeling poly from the interior doors and begin varnishing the one that is clear, dry, and sanded. We wanted to get an interior ladder painted and get the broken panes of glass out of the Watch Gallery ceiling windows. We wanted to assess our Crew accomplishments and priorities. Task accomplished: The air was clear and dry. Eileen painted six of the ten Lantern Gallery window casements and sills. It was too windy to paint outside. Stefan got the two ¾” panes of cracked glass out of the Watch Gallery ceiling windows and covered them with wood and plexi. Megan varnished the door from the sitting room; then she, Erin and Annie peeled, scraped, and sanded two other doors, and Meg had time to varnish another surface. Eileen and Stefan apply the first coat of black paint to the ladder from the Watch Gallery to the Lantern Gallery. Having spent 9 ½ hours scraping it, we were finally able to paint the Watch Gallery ladder. Stefan, Eileen, and Meg got it done and felt good about it because it was not humid and would dry properly. We started the day at the top and worked our way down assessing what we’ve done and what needs to be done. We’ll be able to prioritize, and if breezes blow, get buttoned up by fall. Major priorities are installing a solar fan, putting UV filters on the windows, and putting a door on the kitchen entrance to the cellar. Next steps: We have to remove the deteriorating polyurethane from all the interior doors by scraping and peeling it off and then apply Man o’ War marine spar varnish to them. Weather permitting we will finish painting the interior ladders black. We will continue to address the Lantern Gallery; finish painting the interior window casements, start on the outside casements and walls, put another coat of paint on the railings up there, and paint the exterior of the roof. Michael McWeeney offered to make a new threshold for the dog door and when he does we will install and paint it. We will determine the procedure for painting the stairwell steps, choose what color to use, and prep and paint them. We have to find or fabricate metal rims for two of the three openable port lights and install them. Steve Kalil completed the cover for the hole in the kitchen wall caused by super storm Sandy, and Miller’s got it out to the lighthouse. Both services and all materials were donated by Steve Kalil and Glen Miller. We are waiting for Scott Van Campen to put the cover over the hole. Access: We left Miller’s at 9:20 AM on the Emily Miller captained by Michael Sabatino and came back at 2:45 PM on the Nicholas Miller piloted by Rob Stumley. Purpose of the trip: We had to continue to address the deteriorating polyurethane on the doors. 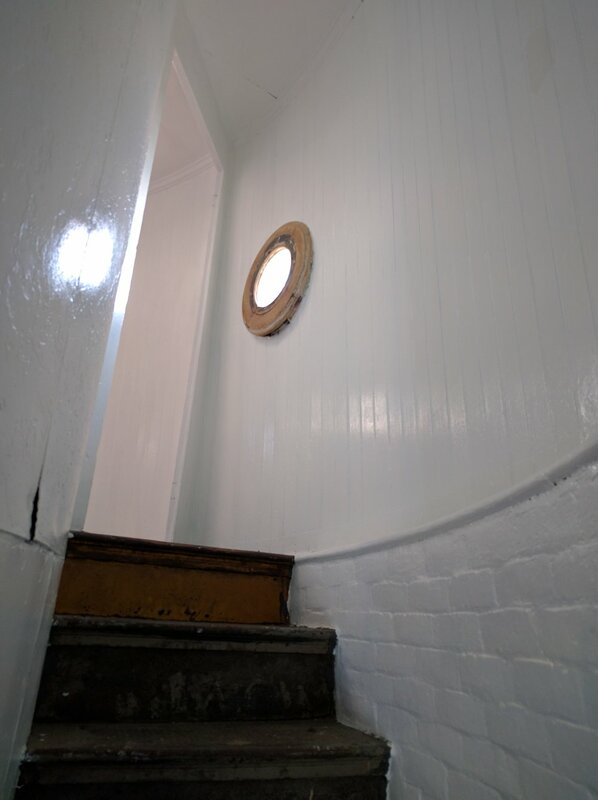 We wanted to put a final coat of paint on the stairwell between the third and fourth floors and put another coat of paint on the beadboard base of the Lantern Gallery wall. We also wanted to put a coat of paint on the exterior Lantern Gallery railings. Tasks accomplished: Megan took down the under-stair closet door in Kate’s bedroom and Erin peeled deteriorated polyurethane from it. Erin, and later Megan, completed one side of that door; the other side is not peeling yet. They then removed the paneled closet door in the sitting room and, with Eileen, began peeling the poly off. They decided not to rehang these doors until the other sides are complete. Megan put a third coat of paint on the stairwell between the third and fourth floor; it is now complete. Eileen put a second and third coat of paint on the beadboard walls in the Lantern Gallery. After ensuring it was not too windy, Michael went out on the Lantern Gallery balcony and put a coat of black paint on those railings. It looks great. Michael also used a sawzall to remove a spike from the front granite steps, which was a safety concern. Next steps: We have to continue removing the deteriorating polyurethane from all the interior doors by scraping and peeling it off, and will apply Man o’ War marine spar varnish to them once the humidity breaks. Weather permitting we will paint the interior ladders black. We will determine the procedure for painting the stairwell steps, choose what color to use, prep and paint them. We will reinstall the ventilation disks in the Lantern Gallery. We will continue to address painting the exterior features of the Lantern Gallery. Michael McWeeney offered to make a new threshold for the dog door and when he does we will install and paint it. Scott Van Campen is making rims for two of the operable port lights on the fourth floor; he will fit them with glass, and we will install them. We have to clean up the Lantern Gallery hatch cover and put it back and address any leakage from the door up there. We have to grind off the rusted hinges on the exterior door to the cellar and weld on replacement hinges. We have to grind the casements on the kitchen windows so that we can paint them and make shutters for them. At some point this season we will paint the exterior walls and railing around the Watch Gallery and Lantern Gallery balconies. Steve Kalil has completed the cover for the hole in the kitchen wall and Miller’s delivered it to the lighthouse. Scott Van Campen will install it. Access: We left Miller’s at 9:20 AM on the Nicholas Miller captained by Carl Hoerning and came back at 3:00 PM on the Nicholas piloted by Tony Semple. Purpose of the trip: We had to continue to address the deteriorating polyurethane on the windows sills and doors. We wanted to finish painting the stairwell entry door surrounds and put a coat of paint on the beadboard base of the Lantern Gallery wall. We expected to paint the interior ladders. Laura painting the beadboard in the Lantern Gallery. Task accomplished: Because of the high humidity, we did not do what was planned. Megan, Annie, and Leslie took down the under stair closet door in the sitting room and peeled deteriorated polyurethane from it; they decided not to varnish it, and rehung it at the end of the day. Laura put another coat on of varnish on the window sills we addressed last week; Erin worked on the sill on which varnish had been mistakenly applied on top of polyurethane and got it ready to varnish. Laura painted the entry door surrounds to the sitting room and bedroom. Eileen and Laura worked on the Lantern Gallery. Eileen removed the screened ventilation disks in the interior walls and decided to take them home to work on cleaning them. Then she and Laura painted the beadboard walls. Erin and Megan scraped the dog door edges because it was difficult to open, and loosened up the dogs; it closed easily when we left. We expected to paint the interior ladders with high gloss paint, but it was too humid. John Tretout had given us black paint for the exterior, however, and we decided that Annie would scrape the Lantern Gallery railings and then we would paint them; she spent the morning working on them. However it was so windy on the balcony that when Laura went up after the break to paint what Annie had scraped, she found that the paint blew off her paintbrush on the west side of the balcony and barely got one section painted. Later Megan managed to get some paint on the east side railings where it was less windy. It looks great. Next steps: We have to remove the deteriorating polyurethane from all the interior doors by scraping and peeling it off, and then apply Man o’ War marine spar varnish to them. Weather permitting we will paint the interior ladders black. We will determine the procedure for painting the stairwell steps, choose what color to use, prep and paint them. We will continue to address the Lantern Gallery and put another coat on the walls and reinstall the ventilation disks. We will continue to address painting the exterior features of the Lantern Gallery black. Michael McWeeney offered to make a new threshold and when he does we will install and paint it. Scott Van Campen is making rims for two of the operable windows on the fourth floor; he will fit them with glass, and we will install them. We have to clean up the Lantern Gallery hatch cover and put it back and address any leakage from the windows up there. We have to grind off the rusted hinges on the exterior door to the cellar and weld on replacement hinges. We have to grind the casements on the kitchen windows so that we can paint them and make shutters for them. At some point this season we will paint the exterior walls and railing around the Watch Gallery and Lantern Gallery balconies. Steve Kalil has completed the cover for the hole in the kitchen wall caused by super storm Sandy; he met with Scott Van Campen to discuss installing it. Miller’s will get it out to the lighthouse. Access: We left Miller’s at 10:45 AM and came back at 3:20 PM on the Nicholas Miller piloted by Rob Stumley. Low tide was expected at 2:09 PM. Purpose of the trip: We had to start to address the deteriorating polyurethane on the windows and doors. We wanted to finish painting the stairwell entry door surrounds and the stairwell walls and ceiling from the bedroom to the fourth floor and put a coat of paint on the base of the Watch Gallery wall. Task accomplished: Cooper put a coat of paint on the stairwell from the sitting room to the fourth floor, while David painted the entry door surrounds. We had decided last week to paint rather than strip them, and they needed another coat. He and Cooper also painted the base of the Watch Gallery floor. Molding from there has to be reattached but we have to wait until after we install wiring for solar power. Erin and Laura scraped, sanded, and peeled deteriorated water-based polyurethane from three sills and aprons in the sitting room; David worked on one in the bedroom. Laura put two coats of Man o’ War marine spar varnish on them. Next steps: We discovered that we have to remove the deteriorating polyurethane from all the interior doors by sanding and peeling it off, and then apply Man o’ War marine spar varnish to them. We will determine the procedure for painting the stairwell steps, choose what color to use, and paint them. Scott Van Campen is making rims for the two operable windows on the fourth floor; he will fit them with glass, and we will install them. We have to clean up the round ventilation disks in the Lantern Gallery and paint the beadboard. We’ll make sure the dog door is tight, put in new molding around it and paint it, and install the threshold. We have to clean up the Lantern Gallery hatch cover and put it back and address any leakage from the windows up there. We have to epoxy and paint the interior ladders. We have to grind off the rusted hinges on the exterior door to the cellar and weld on replacement hinges. We have to grind the casements on the kitchen windows so that we can paint them and make shutters for them. Terry DeMeo at Miller’s is overseeing retrieving a block of granite from the original lighthouse for the museum—not an easy task. At some point this season we will paint the exterior wall around the Watch Gallery balcony. Steve Kalil has completed the cover for the hole in the kitchen wall caused by Superstorm Sandy; he met with Scott Van Campen to discuss installing it. Miller’s will get it out to the lighthouse along with any welding equipment needed. Access: We left Miller’s at 9:15 AM on the Nicholas Miller piloted by Michael Sabatino and came back at 3:20 on the Emily Miller with Ryan Novak-Smith as pilot. Phil Tobin came along to assess the solar batteries and take them back to Miller’s. Purpose of the trip: We had to continue to scrape the interior ladders and Watch Gallery hatch, remove the flange from the operable window in Jacob’s room, work on the stairwell and dog door, take up the Ram Board on the Lantern Gallery and Watch Gallery floors and put new board down, and start addressing the deteriorating polyurethane on the windows and doors. Task accomplished: Michael scraped the remaining Smart Strip off the Watch Gallery ladder; it was still gooey. We decided to forgo putting epoxy on it for another week. Leslie and Megan put ramboard on the Lantern Gallery floor; Erin sanded and primed the dog door. Megan and Nan put the second coat of paint on the stairwell from the sitting room up to Kate’s bedroom and started on the last flight, from the bedroom to the fourth floor. Erin took up the ramboard in the Watch Gallery, and she and Leslie replaced it with new board. Michael got the flange off the operable window in Jacob’s room with a sawzall. After he and Phil got the web camera batteries out—they are toast—he disconnected the remaining equipment from the web camera. Erin worked on the Watch Gallery hatch cover and realized she had to bring it back home; the old Peel Away was still gooey; it is too moist and humid out there this season. (Last year, when we did ten interior doors, we did not have this problem.) 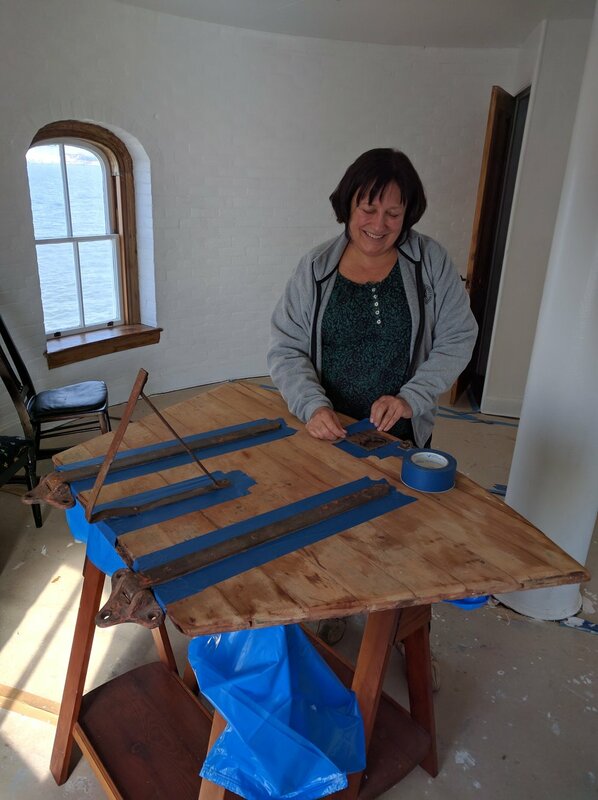 Leslie worked on two windowsills, one in the stairwell and one in Kate’s bedroom, which were dried out and flaking because we used polyurethane on them; she sanded them and then varnished them with Man o’ War marine spar varnish. Erin organized the equipment room; John Tretout had again given us eight gallons of paint, and Michael stored the many tools he donated to the cause, including the sawzall and a sander, a tool box with a variety of pliers, hammers, screwdrivers et cetera, and a drill in that equipment room. Great stuff—all necessary. Michael brought the hatch cover down to the launch, along with Peel Away and scraping tools. We had a lot of stuff to bring back, and we cleaned up and got it organized and down to the platform. Next steps: We are working on addressing the port lights that open on the fourth floor. We will continue putting a second coat of paint on the stairwell brick and cast iron walls and ceilings. We have to get two rims for the operable windows on the fourth floor, fit them with glass and install them. We have to clean up the round ventilation disks in the Lantern Gallery and paint the beadboard. We’ll make sure the dog door is tight, put in new molding around it and paint it, and install the threshold. We have to clean up the Lantern Gallery hatch cover and put it back, and finish stripping and then epoxy and paint the interior ladders. We have to procure new hinges for the exterior door to the cellar, grind off the rusted ones, and weld on replacement hinges. We have to grind the casements on the kitchen windows so that we can paint them and make shutters for them. Terry DeMeo at Miller’s is overseeing retrieving a block of granite from the original lighthouse for the museum—not an easy task. At some point this season we will paint the exterior wall around the Watch Gallery balcony. Steve Kalil has completed the cover for the hole in the kitchen wall caused by Superstorm Sandy and he will meet with and Scott Van Campen to discuss installing it next week. Miller’s will get it out to the lighthouse along with any welding equipment needed. Access: We left Miller’s at 9:30 AM and came back at 3:45 PM on the Emily Miller with Rob Stumley as pilot. Purpose of the trip: We had to remove Peel Away from the Watch Gallery hatch cover and Smart Strip from the two interior ladders. Task accomplished: Meg tried to drill out the bolt holding the phalange on the port light in Jacob’s room, but she could not. We need better tools. Then she and Erin took the Peel Away off the hatch cover. It had not properly dried, however, and had at least two layers of paint, one gray and one brown, which the Peel Away could not fully penetrate and remove. The result was a mess, with smeared paint that could not be removed with water or scraping. They did what they could, propped the hatch up on the floor, and cleaned up the mess, and set the hatch back up on the table to dry out for the next trip. Nan and Annie hit the fourth floor ladder. Though we were using Smart Strip; it had been recommended because it would dry to a powdery layer that could be swept away. The ladders were thick with old paint and rust. But like the Peel Away, the Smart Strip was gooey and wet; they worked on the ladder for a couple of hours, and later Erin helped Annie with the fourth floor ladder, and Nan and Megan hit the Watch Gallery ladder. It was unsatisfying and messy work. After another four hours, the ladders did not seem much better. We had to put the drop cloths out on the railings to dry and then sweep them; all in all, the clean-up was a costly, non-environmentally considerate project. We did what we could to clean the gook and grime from the floors but we will have to replace the ramboard. Then we swept up throughout the lighthouse. Next steps: We are working on addressing the port lights that open on the fourth floor. We will continue putting a second coat of paint on the stairwell brick and cast iron walls and ceilings. We have to clean up the round ventilation disks in the Lantern Gallery and paint the beadboard. We’ll make sure the dog door is tight, put in new molding around it, and install the threshold. We have to clean up the Lantern Gallery hatch cover, and put it back; and finish stripping and then paint the ladders. Of great importance is covering the gaping hole in the kitchen wall. Steve Kalil and Scott Van Campen have agreed to do so; Steve is having a cover made at the shipyard and Scott will install it. Josh Pugliese, who is a mason, will then replace the inner brick wall as a donation to the lighthouse project. Access: We left Miller’s at 2:15 PM and came back at 4:00 PM on the Emily Miller with Rob Stumley piloting. Purpose of the trip: We had to put Peel Away on the Watch Gallery hatch cover and Smart Strip on the two interior ladders. Michael had to photograph and study the dog door threshold and molding, as he is replacing them. Task accomplished: Cooper out Peel Away on the hatch cover, and we added some Smart Strip on the metal parts. Michael checked out the dog door area and then he and Erin put Smart Strip on the ladders. Next steps: Tomorrow we will strip the hatch cover and ladders, and if possible epoxy the ladders. Access: We left Miller’s at 9:45 AM on the Julia Miller, captained by Bart Coma, and came back at 3:30 PM on the Emily, captained by Tony Semple. Purpose of the trip: We had to continue painting the stairwell, dressing doors with a plane and installing hardware, working on the dog door, and scraping the ladders. We also wanted to caulk the beadboard in the Lantern Gallery and work on the round windows that open on the fourth floor. Task accomplished: Nan cut in and Megan rolled on the second coat of paint the stairwell from the kitchen to sitting room and they cut in and patched from the sitting room up to the equipment room. Michael dressed three doors with a plane, and they now close. He also installed a mortise, plate, and doorknobs from the lighthouse on the equipment room door; we can now lock it if necessary. Eileen caulked the entire Lantern Gallery. Annie finished prepping the fourth floor ladder and started on the Watch Gallery ladder. In order to free the dog that was frozen, Erin applied white lithium grease to it and the whole door, and after three applications, Michael was able to loosen the dog. He then applied epoxy sealant to the whole door and the area below it, which is iron. In our attempt to remove the wood centers that were installed in the windows in Mae and Jacob’s rooms on the fourth floor and the stairwell when the lighthouse was sealed, we removed the wood centers and discovered that the rims in the two rooms are missing. We lined the three apertures with plastic, put the wood centers back, and screwed scrap wood around each window to keep it the wood in place. We took up the ramboard in the Lantern Gallery, vacuumed that gallery and the Watch Gallery, and swept up throughout the lighthouse. The crew at the end of a long day. Next steps: We have to address the round windows that open on the fourth floor, locate rims, install glass, and re-install them in order to have ventilation up there. We will continue putting a second coat of paint on the stairwell brick and cast iron walls and ceilings. We have to clean up the round ventilation disks in the Lantern Gallery and paint the beadboard. We’ll make sure the dog door is tight, put in new molding around it, and install the threshold. We can then put the Lantern Gallery hatch cover, which we painted, back. With a new solvent we will apply to the ladders, we expect to be able to get them ready for epoxy and paint. We have to replace the rusted hinges on the cellar door. We have to strip the Watch Gallery hatch and varnish it. In order to prepare estimates on replacing the promenade railings, for which we may get some funding, Megan measured them. Of great importance is covering the gaping hole in the kitchen wall. Steve Kalil and Scott Van Campen have agreed to do so; Steve will have it made at the shipyard and Scott will install it. Josh Pugliese, who is a mason, will then replace the inner brick wall as a donation to the lighthouse project. Access: We left Miller’s at 11:45 AM on the Julia Miller captained by Michael Sabatino and came back at 1 PM. Purpose of the trip: We cancelled the regular Crew workday at 7:30 AM because of thunderstorms all night and morning. Another one was expected in the afternoon. Terry DeMeo wanted to send George and Mike out with the generator container that Miller’s had purchased for the lighthouse and to look at the granite blocks from the 1839 lighthouse so they could work out how to retrieve one for the museum. Task accomplished: George and Mike brought the new generator “house” out and put it on the promenade. We will use it for gasoline storage; they are going to order a slightly different container, one that opens at the top and side, so we can slide the generator in and out. They will bolt it to the plinth and promenade deck. The temporary cover we put on the stairwell port light had blown in, and they put it back and taped it. We must get the glass for the rim and get that window tight. The area around the dog door floor was very wet and that has to be addressed as soon as possible. They recommended we clean the door itself and the dogs with white lithium grease. They opened the exterior cellar door and had some trouble closing it because the hinges on the right side are rusted through. We looked at the granite blocks from the original lighthouse that are scattered around the caisson base on both the Verrazano Narrows and Bayonne sides. George and Mike will come back out at low tide and mark the one that we can move most easily, and come back to get it. They also looked at the remnants of Kate’s canopy at the base of the reef and will retrieve that as well. Next steps: We hope to put the round stairwell window back and work on the round window in Jacob’s room and in Mae’s room. We have to put a second coat on the stairwell. In the Lantern Gallery, we have to clean up the round ventilation disks, and caulk and paint the beadboard. We have to replace the rusted hinges on the cellar door. We have to dress the door to Jacob’s room and the closet door in the sitting room and install antique doorknobs. We have to scrape and seal the interior ladders and then paint them. We will assist in any way we can with retrieving a granite block. Megan and Stefan at the round window in the stairwell. Access: The Crew left Miller’s at 10 AM on the Nicholas Miller captained by Tony Semple and came back at 4 PM on the Nicholas with Tony again at the helm. The guests came out on the Nicholas with him at 1:30 PM, and Terry sent the Emily captained by Michael Sabatino to bring them back at 4 PM. Purpose of the trip: We wanted to paint the stairwell from Kate’s bedroom to the top, put another coat of primer on the Lantern Gallery, and start on the ladders. We had to deal with the round window in the stairwell. Annie working on the ladder. 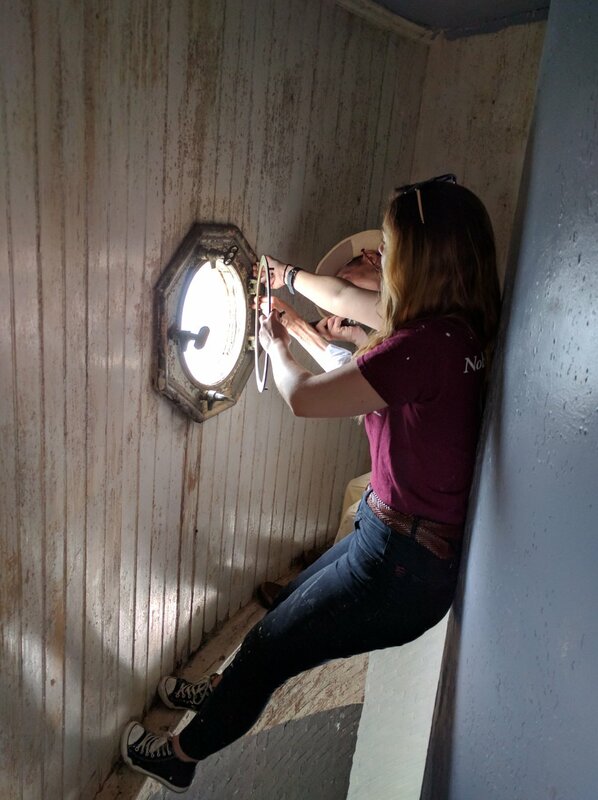 Task accomplished: Megan and Stefan dismantled the round window in the stairwell; we have the rim and will ask Caddell Dry Dock to insert glass into it and clean up the rim, the closure and the turnbuckles. Then they put white primer/paint on the brick, cast iron, and beadboard walls in the next flight of the stairwell, from Kate’s bedroom to the fourth level. Cooper put another coat on the roof. Eileen scraped the beadboard walls in the Lantern Gallery. Annie scraped the ladder outside Mae and Jacob’s rooms. Erin cut in a second coat on the brick and cast iron walls from the kitchen door surround up to the sitting room and put another coat on the Watch Gallery hatch. Cooper rehung the door to Jacob’s room. Eileen shop-vacced the Lantern Gallery, the Watch Gallery, and the stairwell. We cleaned up rollers and brushes and swept the rooms. Mark and Glen from the New York Landmarks Conservancy toured the lighthouse and discussed the options for possible funding. We offered a professional cleaning of the cellar, which will not be done by volunteers; repair of the Lantern Gallery; and work on the railings, though there are many other options such as repair of the dog door area. Next steps: We hope to put the round stairwell window back and work on the round window in Jacob’s room. We have to put a second coat on the stairwell. We have to continue to address the Lantern Gallery, as there is no communication from the Coast Guard about assistance. We must deal with the dog door; it needs to have the dogs repaired and a new threshold and molding around the sides. We have clean up the round ventilation disks, caulk the beadboard, and paint it. For now we will caulk the one window up there that is leaking but ultimately we have to remove each window and scrap, epoxy, and paint the surrounds. We have to dress the door to Jacob’s room and install antique doorknobs, keyhole covers, mullions, and latches for some of the other doors. We have to scrape and seal the interior ladders and then paint them. Be great to paint the stairwell steps, step by step. Access: Left Miller’s at 10 AM on the Anthony Miller captained by Marty Plage; back at 4 PM on the Emily Miller with Rob Stumely at the helm. Purpose of the trip: We wanted to paint the stairwell from the sitting room to Kate’s bedroom. We decided to prime the Lantern Gallery roof white. We had to touch up all the rooms which we had re-primed in rusty places, dress more doors with a plane, and continue work on the two hatch covers. Task accomplished: Megan put the white primer/paint on the brick, cast iron, and beadboard walls in the next flight of stairs, from the sitting room up to the equipment room. Cooper put it on the roof, ten plates of cast iron with 4” sides. Tim dressed the entry and the closet doors in Mae’s room and the entry door to Jacob’s room, which has to be re-hung because the screws failed. He removed the hatch cover from the Watch Gallery so we can strip it. Erin touched up the primed places in the completed rooms; they are now perfect, and put another coat on the Lantern Gallery hatch cover, which we have to reinstall with better screws. Tim evaluated the threshold and surrounds of the dog door; we have to rebuild them. He will make drawings. We cleaned up rollers, brushes, and ourselves as best we could, swept everywhere, and tidied up everywhere, including the Lantern Gallery. We have to replace the ramboard up there. Next steps: Megan is intent on finishing the first coat of primer on the stairwell, and Cooper will put another coat on the roof. Everything will need at least one more coat. We have to dress most of the doors that are hung with a plane, and find and install antique doorknobs, keyhole covers, mullions, and latches for some of them. We will put the hatches back and replace the threshold under the dog door; the door itself has to be removed and repaired because it does not close properly. We have to paint the Lantern Gallery window surrounds, clean up the round ventilation disks, caulk the beadboard, and paint it. We have to scrape and seal the interior ladders and then paint them. Access: Left Miller’s at 9:45 AM on the Emily Miller captained by Phil Tobin; back at 3:30 PM on the Nicholas with Tony Semple at the helm. Purpose of the trip: We wanted to brush, spot prime, and paint the stairwell from the kitchen to the sitting room. We had to address the Lantern Gallery again, scrape the roof down one more time, and apply sealant. Ceiling of the lantern gallery after Cooper applied the sealant. Task accomplished: After everyone did more sweeping in the stairwell, Megan put primer on the exposed brick, Eileen cut in around the ceiling, and she and David painted the cast-iron wall from the kitchen to the sitting room. Meg also spot-primed rust-stained places on metal surfaces in all the rooms. Cooper and Erin scraped the Lantern Gallery roof and were happy to see that the epoxy on the window surrounds was glass-like. Cooper cleaned up and shop vacced, and after a break, we mixed up sealant, and he applied it to the roof, which has a curved lower shelf. The hatch cover fell off, and David scraped and painted it. The hatch goes through the Watch Gallery ceiling. Eileen and Megan painted the stairwell walls and ceiling, and when they were almost done David and Cooper helped. David painted all the places Meg had spot-primed in the rooms. We re-covered the dog door with plastic; have to build a new threshold, cleaned up rollers, brushes, and ourselves as best we could, swept everywhere and hauled back trash. Next steps: We have to put back the Watch Gallery ceiling hatch and replace the threshold under the dog door up there. We also have to address the one in the Watch Gallery; we have to remove it, strip it with Peel Away, repair, seal, and varnish it. We have to prime and then paint the Lantern Gallery window surrounds and roof. We will continue painting the mighty stairwell. We have to scrape and seal the interior ladders and then paint them black.